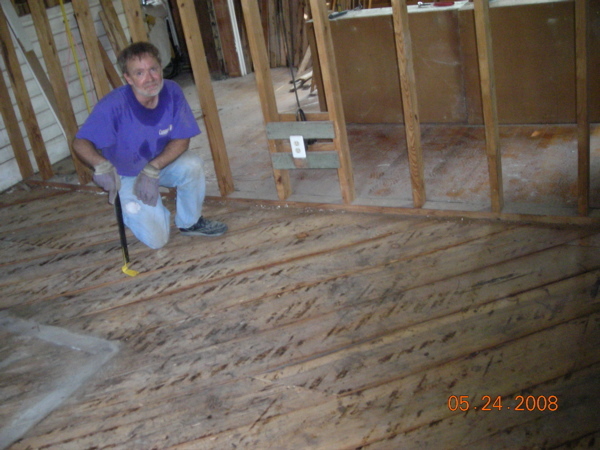 Don and I pulled the oak strip flooring from one of the bedrooms in Apartment 1 on Saturday.Â We did half the other bedroom today.Â I thought about his dad some while we did it. The last time we did this together, his dad cut church and helped while his mom kept the Little One for us.Â I miss his dad. Start by sweeping up the room. 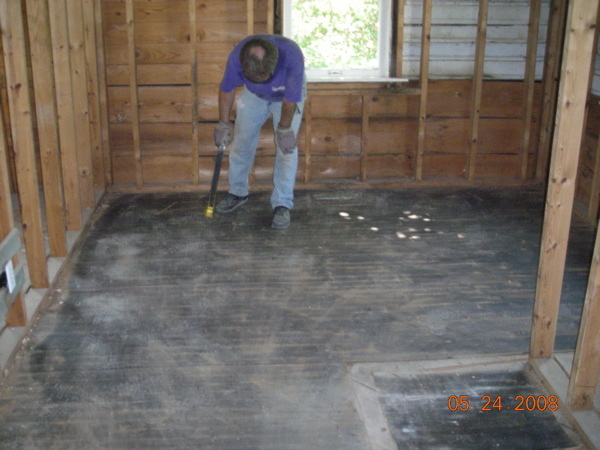 If you’re the floor puller, you will spend most of your time scooting around, and you don’t want to scoot into splinters. Then, find the side of the room with the tongues exposed. Because the floor was nailed down through the tongue, it is easiest to pull from the tongue side. Start at the end which is exposed. 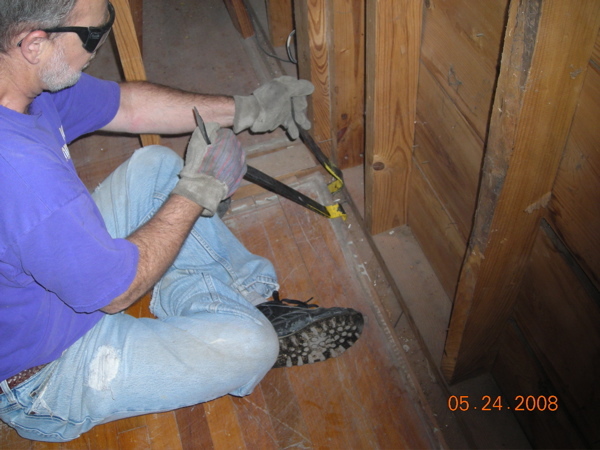 Don uses two pry bars, and rocks them toward him to help loosen the nails. We like to work left to right, perhaps because the tongue end is on the right, perhaps because we are right-handed.Â If there’s room, tap the pry bar with a hammer to encourage the pry bar to slide under the strip. Move the pry bars down the strip until the strip is removable. 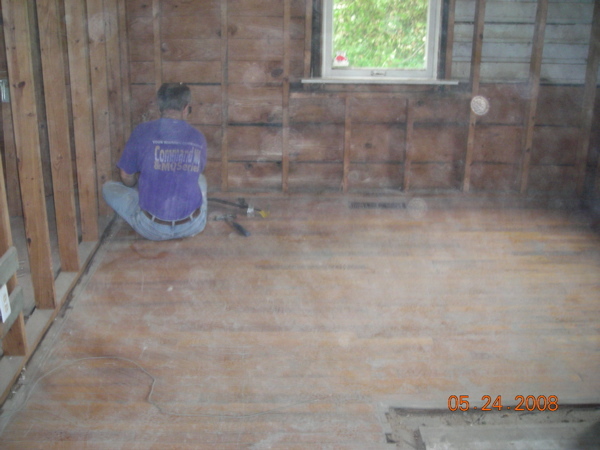 After an hour, we had about a quarter of the room done. . This photo illustrates the tongues on the short ends of the strips. The other ends have grooves. After a couple of hours, Don’s cell phone rang, so we took a break. 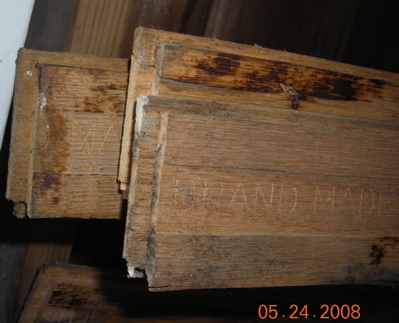 You can see that sometimes, the nails stay behind, stuck in the subfloor. Then, we went back and swept up. 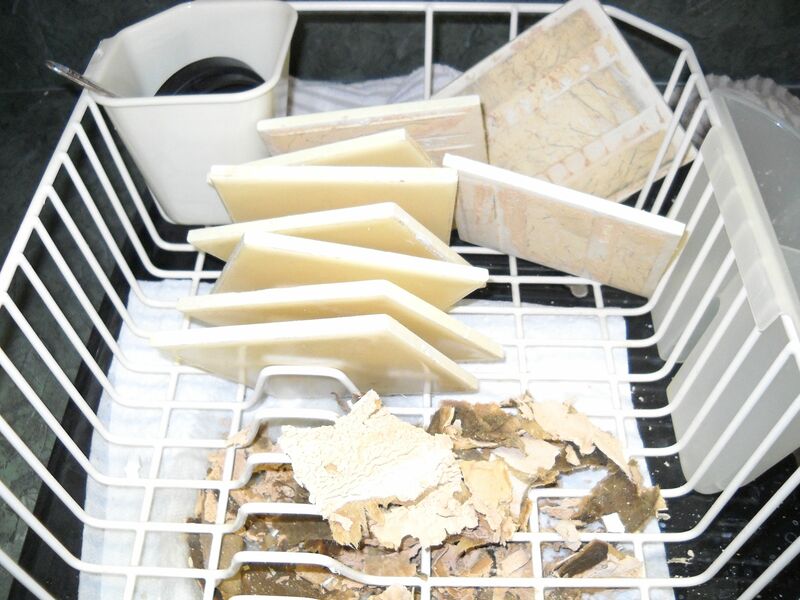 I pushed all the debris into the bathroom and left it for another day. 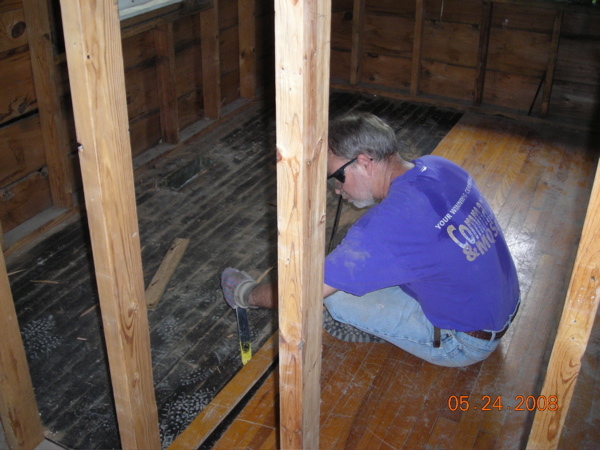 Don pulled the nails that stayed in the subfloor. 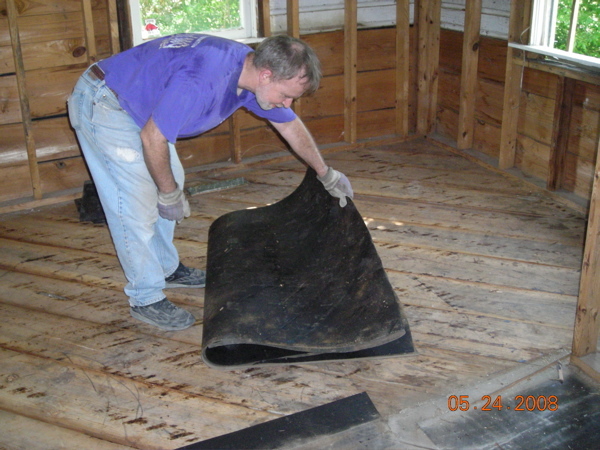 Then Don folded up the tar paper (and helpfully posed for my slow-as-molasses camera). 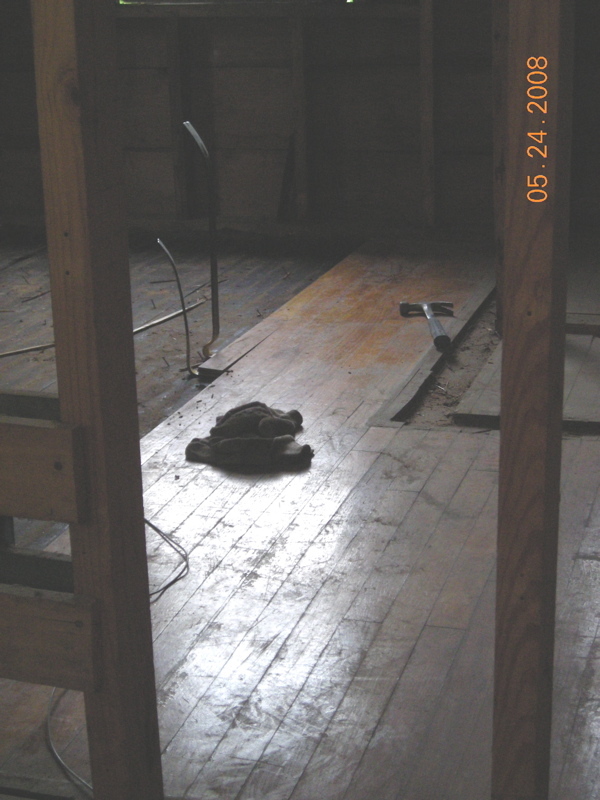 Isn’t it interesting that the subfloor was laid diagonally? I suppose that decreased the odds that a strip would line up with the joint between the subfloor pieces. We left the room broom clean (another round of sweeping), and all nails pulled. (We even sorted about eighty percent by size and put them on one of Don’s carts.) The job took about five hours. 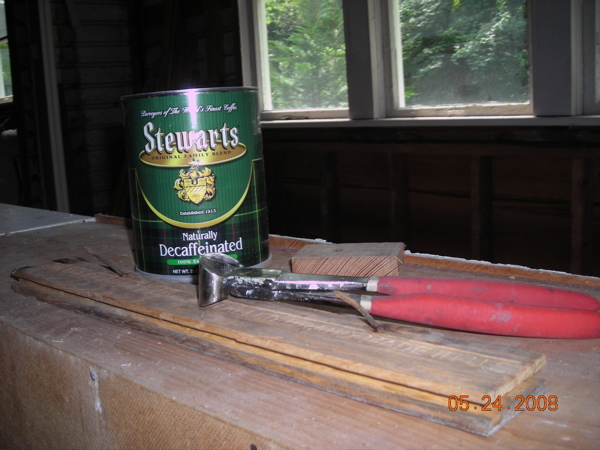 During Apartment 1 demolition last week, I came across evidence tending to corroborate my belief. See up at the joint between the wall and ceiling? It’s a shim made of cardboard, but the words are upside down. Never fear, though, I can rotate and crop. But, for those of you who don’t want to click through, what does it say? Yep. Ruberoid Eternit Asbestos Cement Siding. Woo-hoo! * Although James Whitcomb Riley, the Hoosier poet, probably coined the phrase first, we should also look to Douglas Adams‘ theory:Â â€œIf it looks like a duck, and quacks like a duck, we have at least to consider the possibility that we have a small aquatic bird of the family anatidae on our hands.â€Â As longÂ as I’ve mentioned Riley,Â his Italianate house** is in Indianapolis and is open for touring.Â It has exquisite examples of stenciling.Â We always intended to go back for inspiration, but we never stayed in our Victorians long enough to do the finish stenciling. **OK, it wasn’t really Riley’s house.Â He was a houseguest who never left.Â He lived there forÂ 23 years with the family who did own the house. … When your 5yo daughter finds some kids’ names chalked on the underside of the stairs in the grody, dark, scary hallway and says, “Mom! Now we can be on TV!”Â So I took her picture with them.Â I think we may be watching too much If Walls Could Talk. (names in blue chalk: Martin, Madlen [sp? ], Tom J., Jack B. 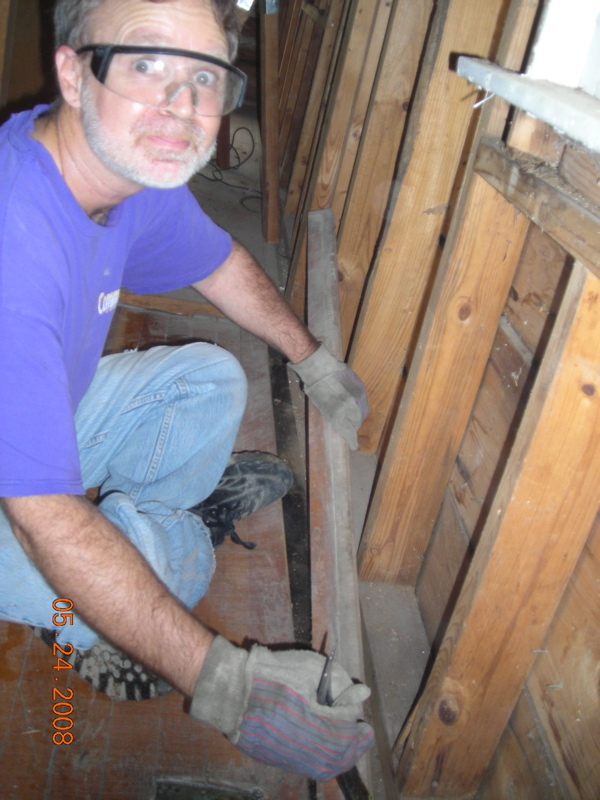 )Â She also helped clear out under the stairs, wearing a dust mask and gloves that were too big for her, until I got grossed out by it all.Â Then we turned to nail pulling. We continue demolishing the house.Â (I hope that it’s not the ceiling tiles on the walls that are holding the house together because they’re gone. 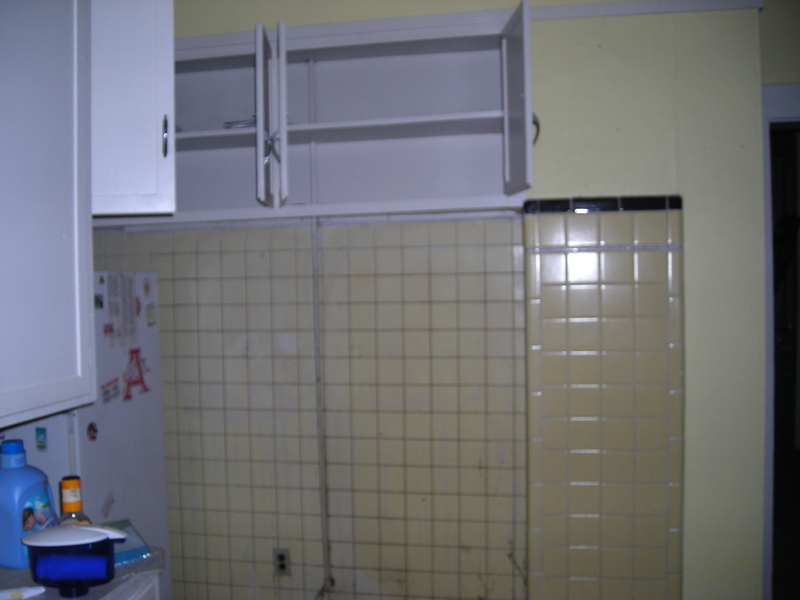 )Â Last week, Don called me at work to tell me about the kitchen door in mid-airwall.Â To put it in context, below is the kitchen (looking north toward the scary, grody hallway) before we bought the house. Wait!Â What’s that door doing there?Â Hanging in mid-air? Oh, it’s just a second way to get to the stairs.Â Or it was.Â See the risers’ shadows? “An escalator can never break: it can only become stairs. You would never see an Escalator Temporarily Out Of Order sign, just Escalator Temporarily Stairs. Sorry for the convenience.” Mitch Hedberg (1968-2005). I forget why it didn’t work out in our Kensington kitchen, and our Ashland kitchen wasn’t actually attached to our dining room so it wasn’t possible there. (You had to go through the butler’s pantry.) And one of the criticisms of our Ashland Italianate was: “The kitchen doesn’t open into the family room.” (Don got tired of hearing that. He felt they should be grateful the kitchen wasn’t in the basement.) So, we are working out open, yet maybe closable, connections to the dining room and family room. 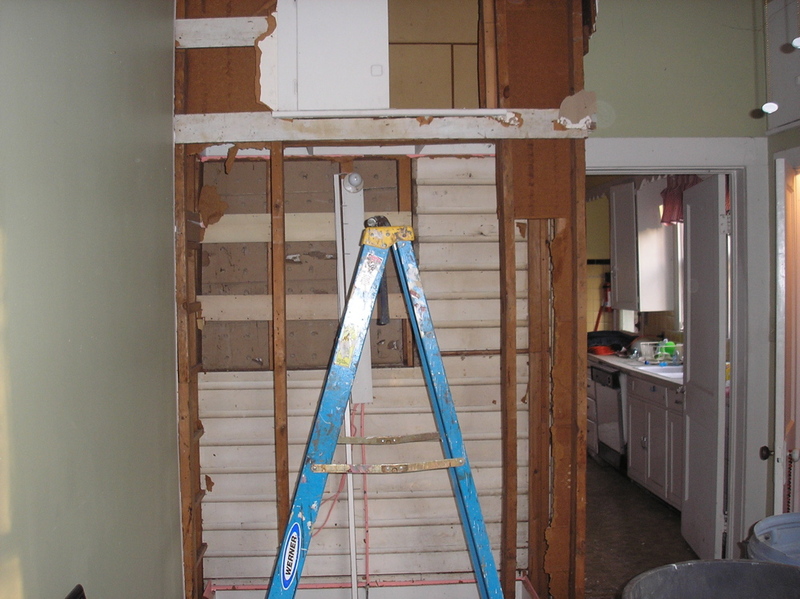 These pictures are of the future family room wall (facing east) and the west kitchen wall (before the tenant moved out – and as it looked last week). The bathroom door from the kitchen is just visible to the right in the kitchen shots. 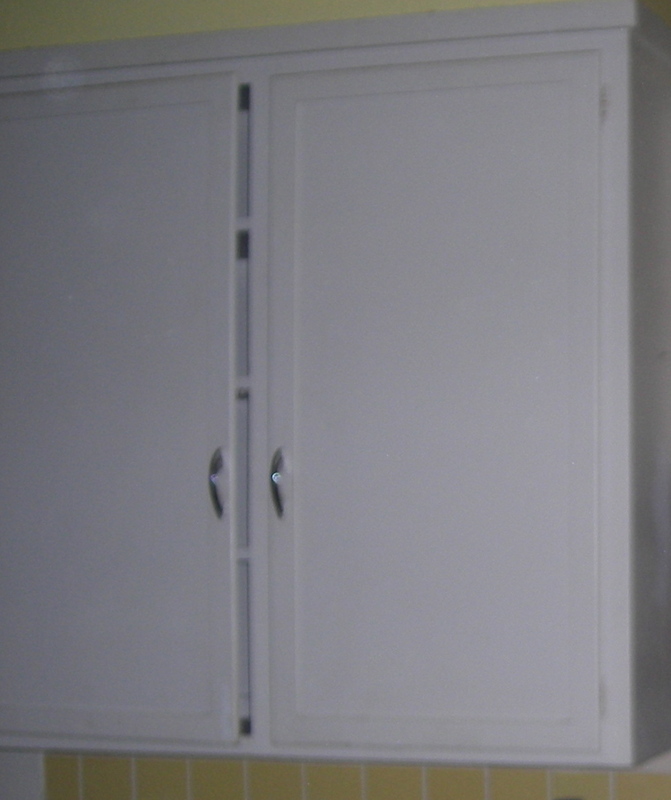 (The family room picture was taken after we got most of the closet out.Â It’s all gone now.) You can see the clapboard and the former window. 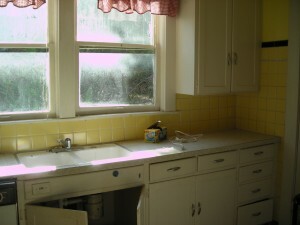 The former window is pretty much in the corner of the current kitchen. Below is another view from the second bedroom of Apartment 1. 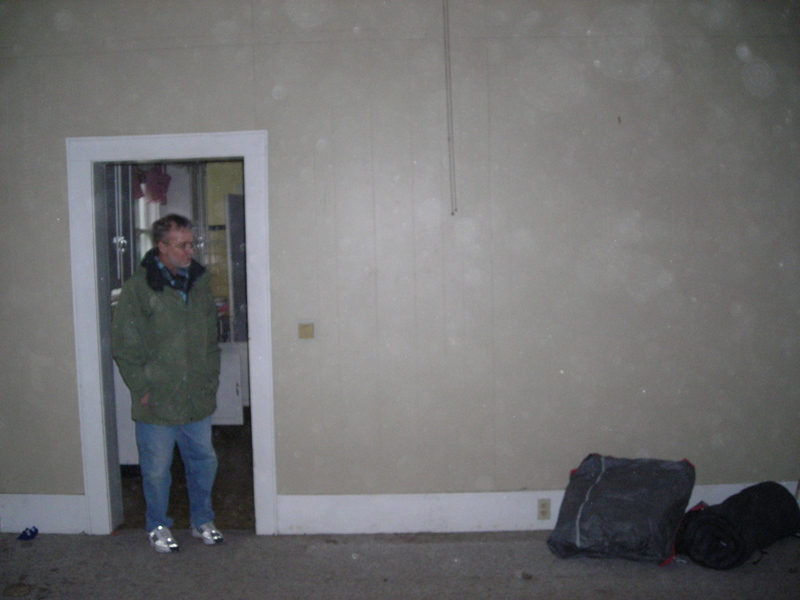 Don is standing in the bathroom door, the kitchen window is visible through the stud wall (load-bearing, btw), and the kitchen door is also visible. Barely. You might see where I’m going with this. 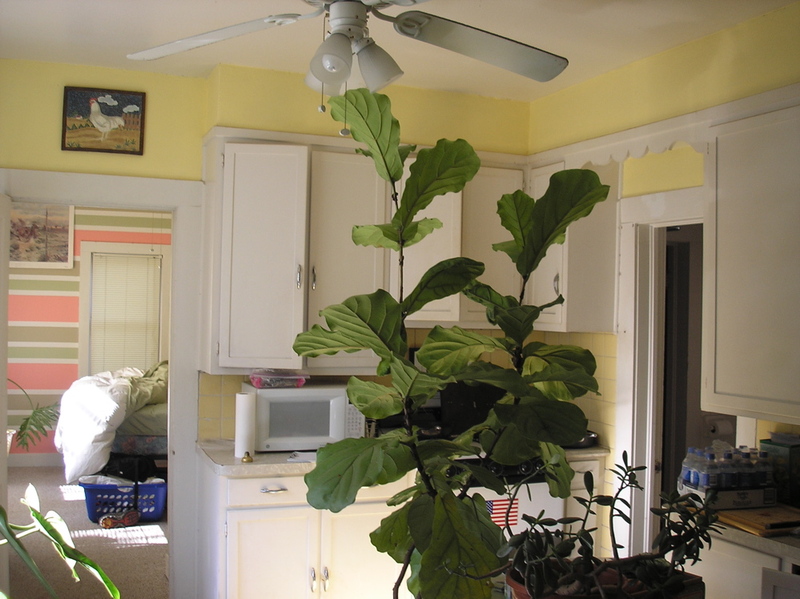 Restore the window-sized access to the family room, and either a window of similar size or bigger to the dining room. Centered, I think, because symmetry is important to me. I’d like to have storage on that dining room wall, maybe like this one (below) that showed up on Craig’s List in Chicago, only bigger and longer. Then I could keep my china in the dining room, and set it on the pass-through when it comes out of the dishwasher to put away. 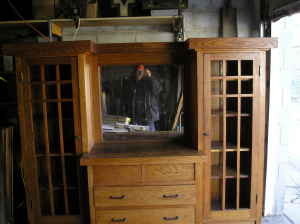 Maybe use some of the doors Don bought off Craig’s list last fall. (Isn’t it nice? Craig’s list in Chicago. $3600. 77″ long by 66″ tall and 21″ deep.) And I could throw popcorn at the people in the family room, or whatever it is you do with a kitchen that opens onto the family room. 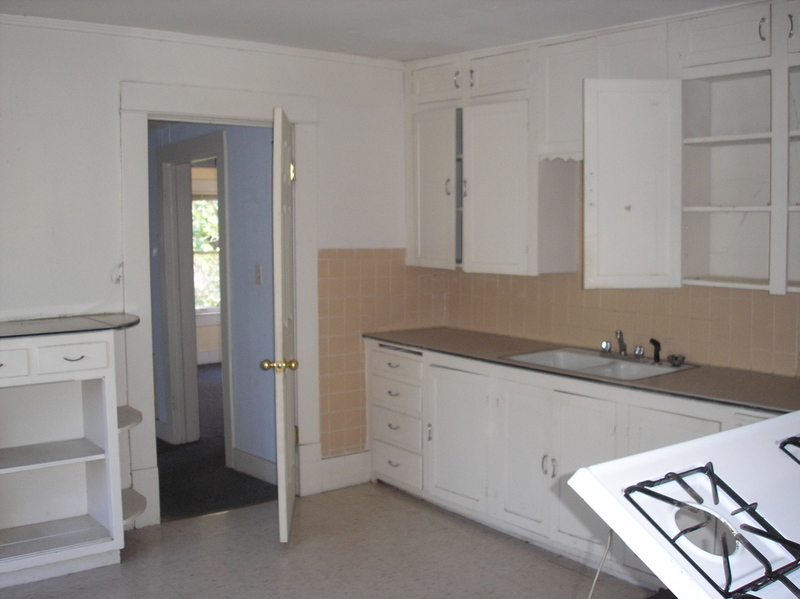 I checked out the Bungalow Kitchens and Bungalow Dining Rooms from the Fayetteville Public Library today. 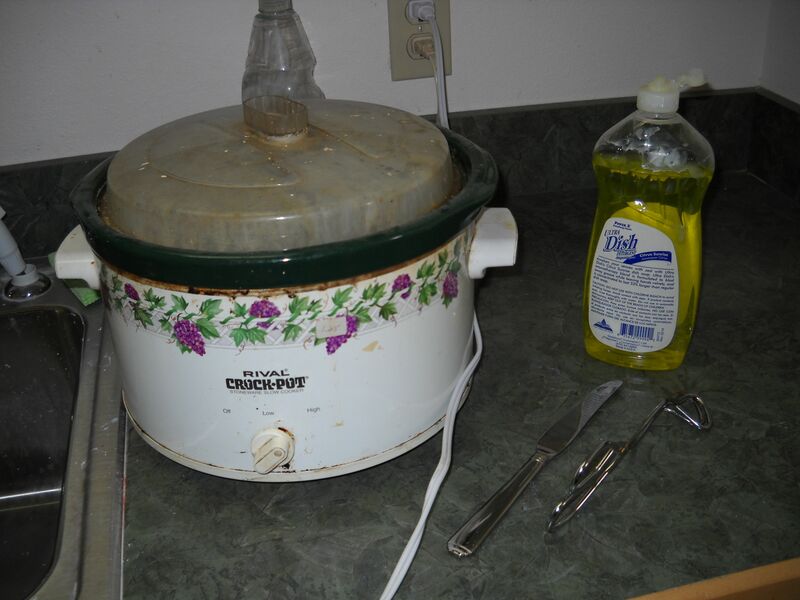 (We have B’Kitchens and B’Bathrooms somewhere in storage.) Examples of pass-throughs and built-ins abound. I’d forgotten how much the focus is on California in those books until re-reading them. I saw at least one where the pass-through was closable. Like a pocket door hung perpendicular to the ordinary way. 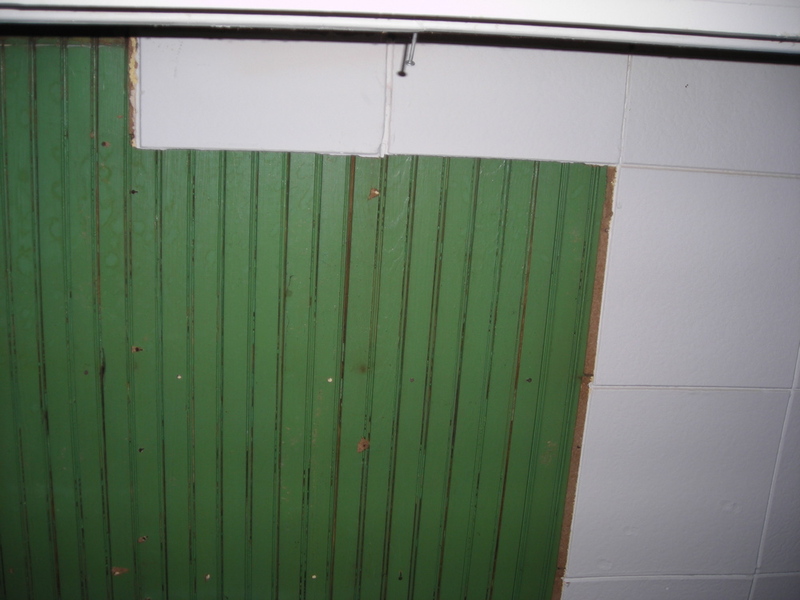 I suppose tambour doors or sideways doors could also be closable if I wanted to close off the pass-through. *Elves might be an even better idea than a pass-through, but they seem to be harder to keep happy. We have power to Apartment 1 now, and also to the hallway and Apartment 4′s kitchen outlet upstairs (on Apartment 1′s downstairs circuit for some reason). We also have hot water in the house although, as of noon yesterday, Apartment 4 still didn’t. No visible leaks (except, perhaps, in Apartment 5, which is the basement apartment, where we know we have a clogged sink), so no burst pipes yet. Only the Apartment 2 kitchen sink is still frozen.Â (We thought we had lost power permanently in Apartment 2, but that turned out to be a blown fuse, so life is good.) Isn’t the stalagmite cool?Â It was a stalactite until it started to thaw. Demolition and clean-up are progressing in the basement, where the water heater fired up a couple of times while Don was sweeping. Nasty, by the way (the sweeping).Â Probably hadn’t been done in forty years. The basement (not the apartment, but the basement part) is all cleaned and swept, with about 10 more minutes to finish cleaning the garage. Then, on to Apartment 5 (the basement apartment). Apartment 2′s “switch” at the fuse box, for lack of a better term, is broken. The electric company guy said that can happen in the cold. Or maybe Don stressed it Wednesday with the 3 space heaters, and it cracked. The electric company guy came by a second time, after turing the power to Apartment 1 back on, to change a bad meter. This is our second “bad” meter at this house.Â We already had a gas meter replaced. I don’t recall replacing a meter in any of our other houses. Of course, we have eleven meters here, which would increase the odds of a bad one. 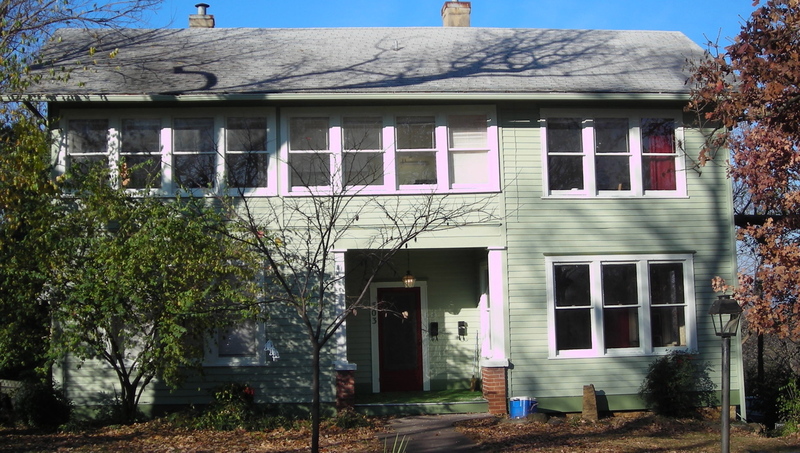 Five gas and five electric meters for the five apartments, plus a sixth gas meter for the 95 gallonÂ hot water heater, which is community property. 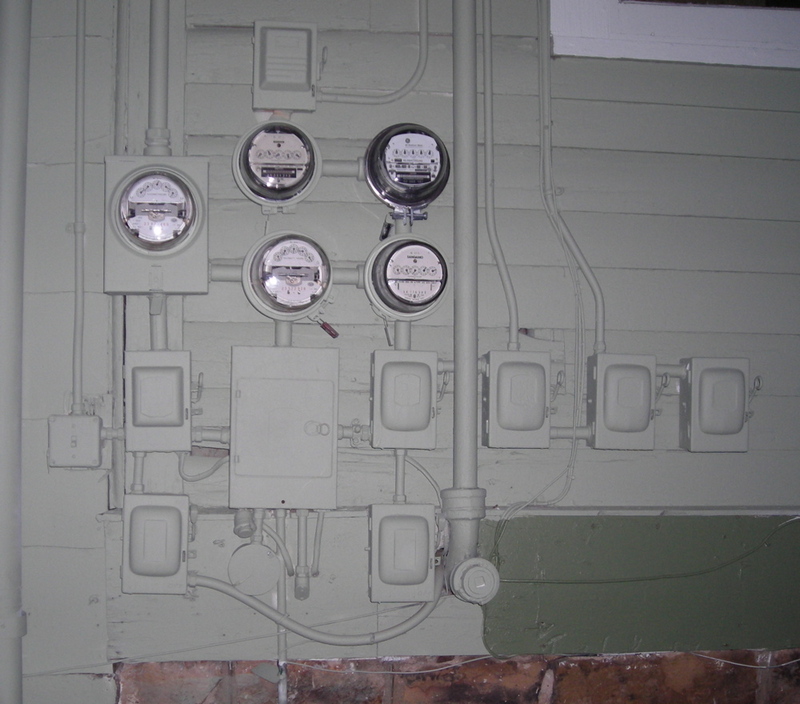 Not sure which of the meters is new, but I do have before and after shots of the electric. Not the gas.Â Aren’t they lovely?